I started a series about people who quilt - maybe not famous - with or without a blog - doesn't matter. This section of my blog is to share with you the stories of normal people who like to quilt. The big quilt top is made up of four smaller Around the World designs put together into one large top. It is draped over her guest bed to show me. She packs them in a box as she finishes them and then when the box is full, she ships it to me! Today's feature is my friend who makes so many tops for me for charity. I got to spend a couple of hours with her back in September - when we were in Arizona for the conference. This is a fun one with a cat theme. She doesn't hang around the internet much so I'm not sure she'll ever see this. Her name is Fran Elnicky and she has been quilting for many years. Until a couple of years ago, she and her mom made charity quilts for me. Her mom passed away. After that, I asked if she would be willing to just make tops for me and I'd finish them here in Poland. Let me share with you the pictures and things I asked her. Fran uses an older machine - nothing fancy and nothing expensive - but it does the job! Becky - Fran, where is your husband's family from - with a name like "Elnicky"? Fran - "We're not sure - but we think somewhere in central Europe - possibly the former Yugoslavia/Balkan States." Becky - "Tell me about how you make these quilt tops for Poland." Fran in action - showing us where she puts the squares as she sews. There squares to the right of her sewing machine in those plastic drawers. Fran - "I make the Around the World design, as you can see. When I get fabric in, either donated or things I buy, I cut them into 4.5" squares and put them in these drawers by color/design. Then I lay out the design, and place the squares next to the machine I have and just sew them together." "I have been known to get children involved in helping me lay out the squares." "My mom and I always used to tie our quilts - that was her job up until shortly before she passed away. She would also do the binding on the baby size we sent you." Fran's sense of humor is evident. Her room is hardly a disaster area when I was there. At least not MY definition of disaster area! "I have drawers and drawers and drawers of squares," Fran told me as she pulled them open and we examined them. "I'm so glad you can use these simple Around the World designs. I enjoy making them and I can use almost any number of squares I have with it." When she gets fabric in, she cuts it into 4.5" squares and then sorts it by color. This way she doesn't have a lot of misc. fabric sitting around (at least not that I saw). One thing Fran does is document her work. 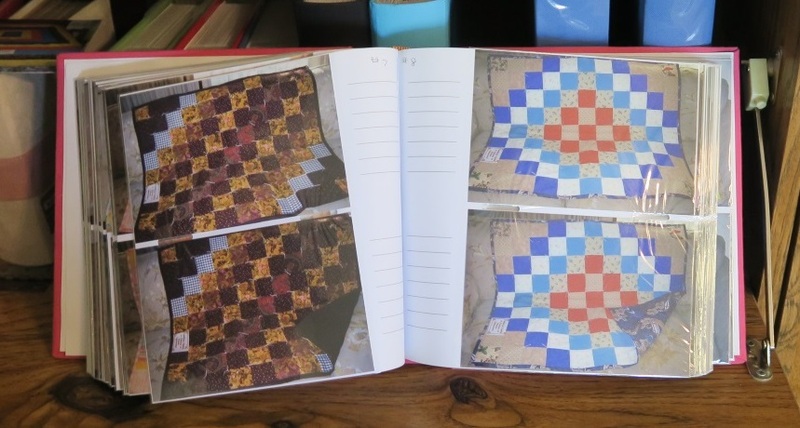 She keeps photo albums of all her donated quilts - and has kept them from day one. The first quilt she sent us back in 2009 - a baby quilt . She and her mom literally sent us hundreds of baby quilts up until the time her mom passed away. A close up of what she has done. 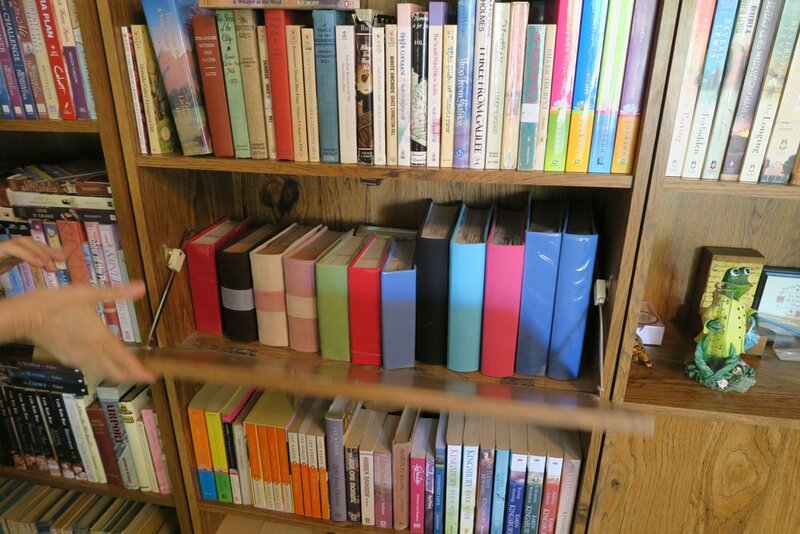 In the middle is her wall of bookcases are her photo albums of all her donated quilts she has made! Fran has been a blessing to literally hundreds of people that she's never met! Thank you, Fran, for your generosity, both in your time, your talents, but of your money! It costs a lot to buy the materials and send those boxes to Poland! But you've brought cheer to so many here in our small area of Poland. I grin whenever I see one of your quilts in a baby stroller here in Poland. They are so distinctive, that, yes, I do recognize them! And that's it for my next installation of the quilter next door. And now...if you need something to finish up your projects - be sure to check out what my sis has for you over in the shop area! Colors may vary slightly from what is shown. However, every attempt is made to accurately represent the colors on the fabrics. Super nice fabric. Perfect for quilting. Who doesn’t need wood planking? This was the very first “Quilted Twins” inspired fabric! We went to a manufacturer and asked if they could make this up. We were sent pictures and were able to choose the “width” of the planks themselves. This is a part of Rachael’s Picks. You can find more of these fabrics on the Rachael’s Picks Fabric Families page under Wood Planks. All of the fabrics in this family feature a series of wooden planks that could be used in as a blender, or perfect as a floor or the sides of a bookcase quilt. Colors may vary slightly from what is portrayed. Screens vary as well as our eyes sometimes see things differently, but we've made every attempt to have the color be accurately portrayed.